To provide some context to current events, in this month’s highlights from Joint Publications Research Service (JPRS) Reports, 1957-1995, we offer West German and Soviet political commentaries on state power, and a core document, the 1962 Constitution of the Syrian Arab Republic. 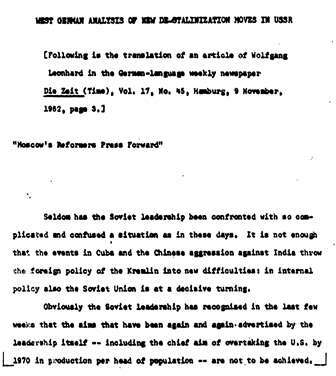 Citing Clauswitz’s dictum that “war is the continuation of politics by other means,” in the September 25, 1963, issue of Izvestiya, commentator Boris Dmitriyev claimed that on the question of nuclear war, both China and the United States were in favor of it. On the one hand, in his argument for the peaceful aspirations of the Soviet Union, the writer recognizes that “nuclear missiles have fundamentally changed the nature of modern warfare;” on the other, the USSR had just the previous year been discovered placing missiles in Cuba. With China and the Soviet Union locked in a bitter controversy over the true nature of communist orthodoxy, one might wonder whether the missiles removed from Cuba were usefully redeployed on the Asian continent—pointed east. Beyond its geopolitical crises, in 1962 the Soviet Union was dramatically reconfiguring its national ideology—away from Stalinist repression and in favor of political and economic reforms. The world remembers Nikita Khrushchev punctuating his politics with a shoe in the United Nations in 1960, but he was also responsible for courageously setting his country on a new path—and turning away from war when it was within his means and the national identity to do otherwise. In a May 18, 2014, online posting by the Carnegie Endowment for International Peace, commentator Qais Fares described Syria’s constitution as Assad’s “magic wand” with which he might “solve all of his own problems,” if not those of the larger nation. 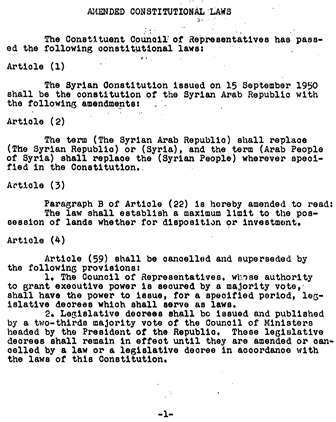 The 1973 revision of Syria’s constitution ceded primacy to the Baath Party which the 2012 revision removed, lending a democratic sheen to Assad’s rule. 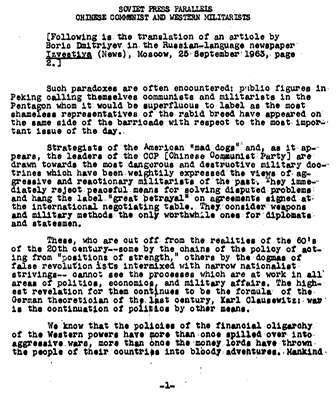 In the 1962 version presented here, the reader will find the standard guarantees of the rule of law, and can draw their own conclusions as to the nature of the “magic” President Assad finds in the latest iteration.